was the heart of the Irish beef trade and the centre of the Worldwide butter trade, based in the Cork Butter Exchange. The area has a host of historic buildings, some still performing the function for which they where built many centuries ago, such as Skiddy's Almhouse, St. Anne's Shandon, and of course the Cathedral of St Mary and St Anne. Others, like the Firkin Crane, have found new life as cultural centers. In the 13th Century, the North Gate Drawbridge formed one of the entrances to the trading centre of Cork. The street established by the Anglo-Normans to give access to the North Gate Drawbridge was originally known as Mallow Lane and is shown on the earliest maps of the city. It is now known as Shandon Street, a street steeped in memories and history; from the famous Bells of Shandon to the long established Buckley’s Drapery, which appears on a 1690 map of Cork as a wooden cabin. locals identify with this particular street due to its characteristically old qualities. The steep ascent from the bridge to the Cathedral at the top was, and still is, a test of stamina of Northsiders as they make their way home after shopping in the city. 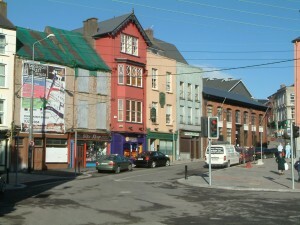 The different architectural styles seem to reflect on the street’s, and also on Cork’s, long history. In 1737 a local wrote that the street had “by various acts …branched itself into such business as almost overtops its mother". 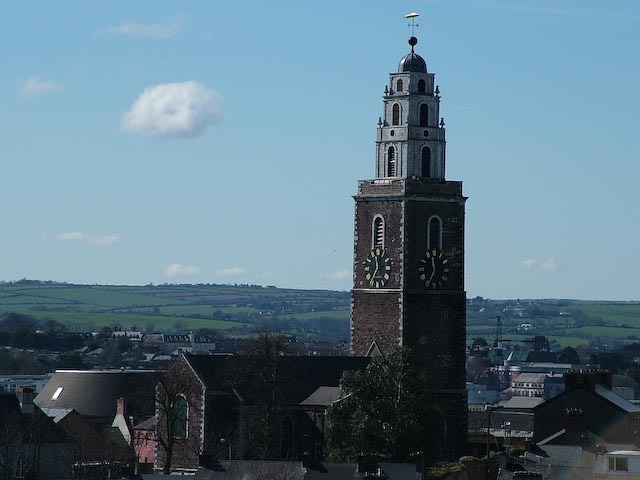 The name Shandon comes from Sean Dún, the irish for ‘Old Fort’. This is said to refer to the ringfort of the MacCarthaigh family, who lived in the area around 1,000 a.d. The church which currently stands was built in 1722, replacing the church destroyed in the siege of Cork in 1690 by English forces. The tall church tower is built in an unusual style with red sandstone being used for the north and east sides, while grey limestone was used for the south and west sides. Some say that this structure gave the city and county their sporting colours. Atop the steeple is an ornamental gilt ball, crowned by a weather vane in the form of a fish, almost five metres in length. Each side of the tower has a clock face with an equally interesting quality. While each clock make for an efficient timekeeper, the minute hands on the east and west faces always go ahead of their counterparts in their ascent from the half hour to the hour. From this the building gets the name “the four faced liar”. However, synchronization occurs once more on the hour. By the mid 1700’s the native butter industry in Cork had grown, calling for the ‘Committee of Butter Merchants’ to be formed by local businessmen. All butter exported from Shandon had to be examined by appointed inspectors, who graded the butter from ‘first’ to ‘sixth’; the first being excellent quality which the sixth was termed ‘grease’ (very poor). Butter casks were made from seasoned oak, sycamore or beech. Oak casks came in particularly useful for preserving butter on long distance voyages. The Firking (casks) which were shipped to places like Brazil and the West Indies were bound in iron hoops. By the mid 1800’s there was need for expansion. In 1849 Sir John Benson designed a Roman temple style portico to be added to the front of the butter market. By the late 19th century the trade had declined and the Butter Market closed in 1924. In 1940 the building by taked over by T. O’Gorman Ltd., who made hats and caps there under the ‘Shandon’ brand. The premises was destroyed by fire in 1976. 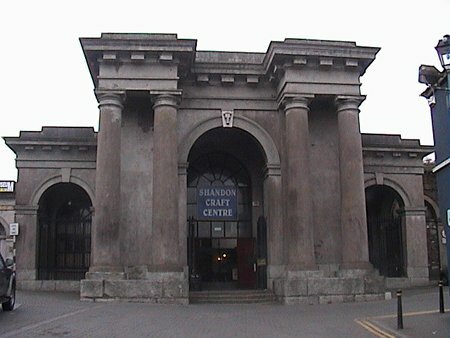 The building has since been renovated and now houses the excellent Butter Market Museum. 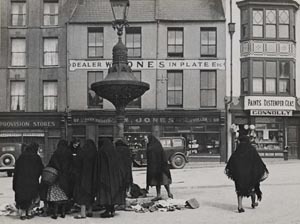 The Dunscombe Testimonial Fountain was situated at the foot of Shandon Street. It was named after the Dunscombe Family who were associated with Cork from the 17th century. Traders gathered to sell clothes at the fountain and Christmas time was especially busy with the sale of holly and ivy. The Dunscombe family can be traced back to Edward, an eminent merchant from London who settled in Cork in 1596. Edward’s grandson Noblett was a city councilor and became Mayor of Cork in 1665. The family lived in Mount Desert and held title to land in the area of Popes Quay where St. Mary’s Church now stands, Currykippane and also ‘Dunscombe March’ in the city centre. The Dunscombe family remained in residence in the Mount Desert area late into the 19 century. ‘Landowners of County Cork 1876’ shows Nicholas Dunscombe owning 1,126 acres at Mount Desert.